Texas has been called an energy superpower. Fracking technology is allowing Texas producers to extract vast amounts of oil and natural that were once out of reach. The state pumps more natural gas that any other. And it leads the country in wind energy. But Texas ranks eighth in solar power. Three attempts by the state legislature to give incentives to solar have failed. The economics of solar in Texas stand in contrast to the rest of the Southwest. And a prominent Texas regulator says solar should not receive any government assistance to expand its footprint. The United States Department of Energy says Texas represents 20 percent of the country’s potential solar output. So why is solar sluggish in Texas? Blame it on mix of policy choices and economics. That means every year, California and Arizona use more and more solar as demand for electricity rises. But like Rai said, it’s different here. “In Texas, we do have a renewable portfolio standard. The goal is 10 gigawatts of power by 2025. But that was met in 2010,” Rai said. And Rai says little has taken place since. “So the overall regulatory context is actually not very strong here,” he said. Although opponents have asked the U.S. Supreme Court to review them, Texas and 29 other states have renewable energy mandates. But the mandate in Texas doesn’t specifically promote solar. The goal is met principally by wind. And developers are far more attracted to wind, where start-up costs are significantly less. The Environmental Defense Fund’s Marita Mirzatuny says that lack of a state solar mandate is stunting solar’s development. “It creates an air of uncertainty in terms of financing,” she said. And unlike California and Arizona, Texas lacks what’s called net-metering. A net meter spins both forward and backward — recording power produced and power used. Electricity produced by solar is subtracted from the customer’s monthly bill. Net metering has allowed solar to expand in Arizona and California. And now the head of the Texas Public Utilities Commission is calling for an end to all energy subsidies. If you install solar, you receive a 30 percent federal tax credit to defray installation costs. Larry Perea heads a small, eight-person company called Solar Smart Living. Perea serves Texas and New Mexico. “Solar needs some incentives still. That 30 percent tax credit is very important,” said Perea. But he says the industry will one day not need subsidies. “As equipment cost goes down, installation costs go down, and energy prices go up, it’s likely to sustain itself without that kind of incentive,” Perea said. Despite a lack of state incentives, two Texas towns have embraced solar. Municipally owned utilities in Austin and San Antonio offer customer rebates. And they’ve signed long-term contracts with solar producers. 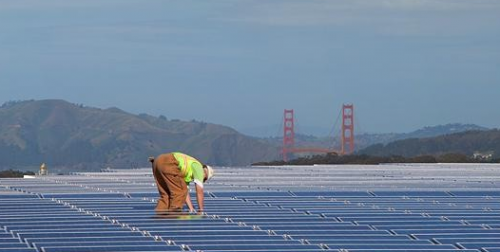 California’s Recurrent Energy hascommitted to send even more solar to Austin. First Solar of Arizona has broken ground on a utility-grade solar farm in West Texas. Raymond Rapisand, head of business development at the University of Texas, El Paso’s Regional Cyber and Energy Security Center, said several Southwest towns aren’t waiting for government incentives to forge ahead. “I’ve seen it happening from El Paso to California, where that’s happening now,” he said, brimming with enthusiasm. Rapisand says there are other hopeful signs. In the last legislative session in Texas, businesses were granted the option of paying for solar equipment installation through their property tax. There’s no upfront cost and like a mortgage, it’s paid out over decades. “Once more people in the business community are aware that, ‘hey I can put solar on my business and put it on my property taxes and I don’t tie up my cash flow, I could get solar,’” he concluded. But the reality is that solar is hampered by deep reserves of cheap natural gas. Oil and gas might give Texas a sense of complacency. Other states, notably Arizona and California, don’t have that option. This entry was posted in KRTS News and tagged Arizona, California, Energy, Environment, Natural Gas, Renewable Energy, Solar Power, Texas Economy, Texas Renewable Energy Standard, Texas Solar Industry. Bookmark the permalink.